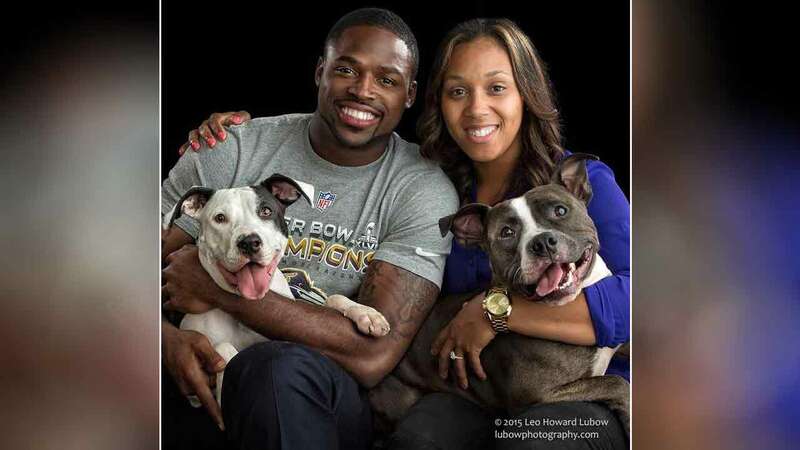 Torrey Smith and his wife, Chanel, are seen here holding two dogs. Picture taken by Leo Howard Lubow - lubowphotography.com. BALTIMORE, Maryland (WPVI) -- Every single cat and dog at a Baltimore animal shelter will now have a much easier time finding their forever home thanks to new Philadelphia Eagles wide receiver Torrey Smith. The Baltimore-area animal shelter BARCS posted on its Facebook page that Smith and his wife, Chanel, announced at a fundraising event over the weekend that they planned to cover the adoption fees for all 46 of its animals. In addition, the Smiths committed to making an extra donation on top of each animal's adoption fee. "Thank you, Torrey and Chanel, for always looking out for Baltimore's homeless dogs and cats and having such a big heart for our city." Smith played the last two seasons for the San Francisco 49ers, but attended the University of Maryland and spent the first four years of his professional career with the Ravens. He remains active in the area. According to ESPN, Smith holds a charity basketball game in Maryland every year with proceeds going to the Torrey Smith Foundation, which has created several reading rooms in Baltimore schools. The foundation holds toy drives and preps and serves meals around the holidays and helps low-income students get the supplies they need for school. Smith signed a three-year, $15 million deal with the Eagles this season. Chanel is from the Philadelphia area, increasing the odds that the strong community outreach will extend to this stop as well. Information from ESPN was used in this post. Philadelphia Eagle and animal adoption advocate Torrey Smith, left, visits with fans at Animal Planet's Puppy Bowl Cafe on Feb. 4, 2016 at the Ferry Building in San Francisco.